From Finland, the duo that call themselves Tervahäät have been producing their eclectic mix of folk and industrial ambient since 2008. Originally released in 2012 on the Anima Arctica label Kalmonsäie, their second album, is now available on vinyl. As bleak as the cover image suggests it sounds like it was recorded in a wooden hut deep in the woods during a blizzard, the flickering warmth of the fire keeping the fingers of the participants from freezing whilst they create music to pass the time before the storm lifts. 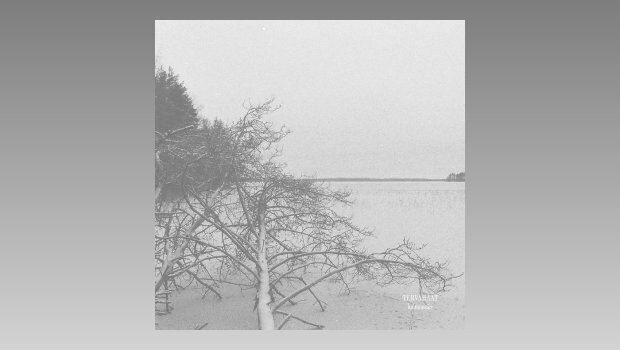 From the introductory monk-like a capella chants through the plaintive folk, largely played on home-made instruments, the style moves from the ritualistic to calm ballads to more industrial tones, the freezing cold of the depths of winter never far from hand, a claustrophobic atmosphere conjured by the echoing production. This is a journey not for the fainthearted, but it brings with it numerous moments of austere beauty. From the first listen it is obvious that there is much more to Kalmonsäie than immediately meets the ear, and I have played it many times since, immersing myself in the alternative world conjured by these enigmatic musicians. The vocals are rich and deep, the bareness of the instrumentation swirling through a vista of atmospheric sounds, largely drawn from nature in it’s most basic and hardest form. There is primitive tribal percussion, produced no doubt on whatever non-musical detritus was to be found at the time, the range of instrumentation being both wide-ranging and unexpected. The vocals move from the soft and gentle to the rich and powerful, sometimes offering up the shrieks and otherworldly voices of the darkest parts of the forest. Death appears never far away in this wild and forbidding environment. Drone sounds add greatly to the process, making for an almost trance-like state upon which various voices and sounds are cast, as in Lumelleluvattu (‘Promised To Snow’) where the repetitive metallic strumming acts as a backdrop for the distant screaming of a soul in torment, followed by the whispered vocal of Huolainniekka which is set to equally repetitious guitar and basic percussion, finally recapitulating the theme from the opening piece, Marrasvirsi (‘November Hymn’), in a very different setting. Saattaja (‘The Pallbearer’) is the most sinister piece, the squeaking wheels of some ancient wooden machinery set to a repeating acoustic guitar with shards of melancholic electric. It gives way to gentle chanting to end the album with calm. But don’t go thinking that Kalmonsäie is without melody; it isn’t and there is much to enjoy, but it is not of the sing-along sort. Tervahäät have subsequently released the Taival abum, which I will have to seek out, and across four albums they have taken wintry ambient landscapes, industrial sounds and ritual avant garde folk to create songs forged in the countryside of the old region of Savonia in the east of Finland, an area rich with history and spiritual significance. This is not an easy listen but give it the time it deserves and it becomes an enthralling one, the bleakness and austerity of a formidable environment seeping out of every pore. Not recommended for children’s parties. Antero Kaarna & Ilmari Riimu – Guitars, Percussion, Vocals, etc.